Despite living in Madison, it’s a rare occasion that I actually eat out in the city. One reason for this is that I work in Jackson so a 20 minute drive for lunch is rarely a viable option. A second is that I enjoy most dinners at home; this gives me a chance to try out new recipes, relive old ones, and generally justify my borderline obsessive need for the latest and greatest in kitchen gadgetry. Still, I’d be remiss if I didn’t admit that I have a few Madison restaurants here and there on my “to-try” list. One of those is The Strawberry Café. Situated in a small white building with an interesting two dining room layout, The Strawberry Café has always looked appealing but it never really ranked as a high priority on my list. Of course, all that changed when the chef & owner Eric Bach asked me to give The Strawberry Café a try. Needless to say, an invitation from the chef was more than enough impetus and over the course of three or so visits, I think I was able to get a fairly good idea of what The Strawberry Café has to offer. As with most things on this site, the first visit began with lunch. It was early August and Mississippi was still in the midst of another sweltering southern summer. While the temperature may have been damn near unbearable outside, it did have a few high points, namely fresh tomatoes. 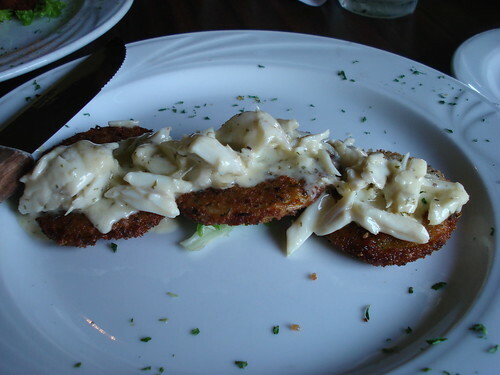 August may seem a little late in the season for fried green tomatoes, but with that much lump crabmeat, who’s complaining? Though this dish may have been rich from the cream sauce, it was all very well balanced by the tartness of the tomatoes and the succulent, subtle brininess of the crab. While the lunch may have started off with a bang from the tomatoes, it was quickly brought back down to the earth with an order of the craw puppies. 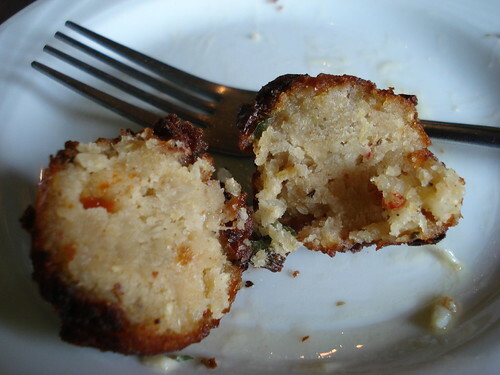 On paper, these crawfish cornmeal fritters sounded excellent. In practice, it was a different story. Heavily fried, extremely dense, and lacking any real crawfish flavor, this craw puppies didn’t live up to expectations. Looking through the menu, I couldn’t help but notice a section entitled “Po-Boys”. There amongst the seafood sandwiches were two beef centric po-boys, the Train Car and the Original Philly Cheese Steak. Since the Philly was topped with provolone and it’s damn near impossible to find a decent cheese steak this far south, I went with the house specialty, The Train Car. 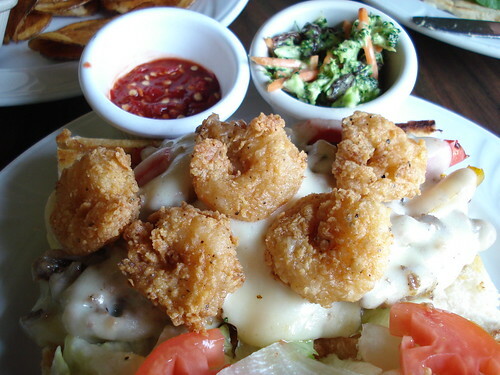 Served on toasted French bread, the chopped prime rib, peppers and onions were topped with melted provolone which was subsequently topped with five fried shrimp. 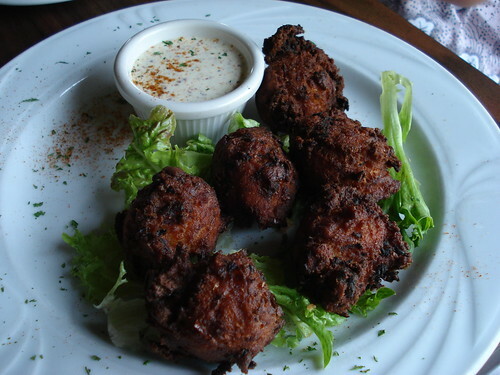 I’ll admit these were some very well fried shrimp. Crunchy on the outside, juicy and just briny enough on the inside, they were excellent fried shrimp, but why were they on a cheese steak? 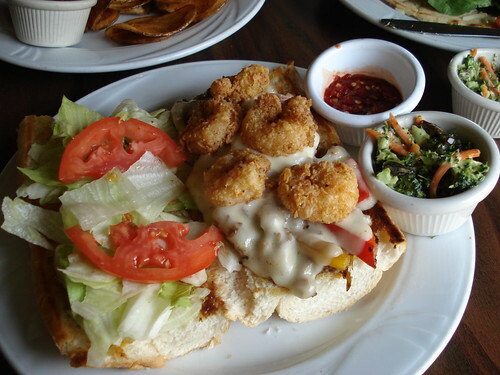 This sandwich really does seem to blur the lines between cheese steak and a po-boy. 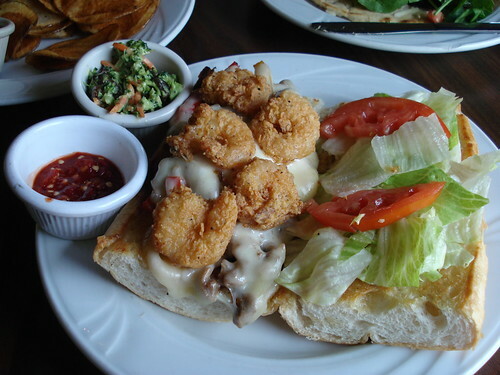 I can see how the French bread, lettuce, tomato, and fried shrimp are screaming po-boy, but the chopped steak, peppers, onions, and cheese are crying out for an Amoroso roll and cheese whiz. Even with this small identity crisis, this sandwich was well worth a try. While I had every intention to follow that first foray into The Strawberry Café’s menu with a second and third visit, things don’t always go according to plan. In fact, it wasn’t until February, in the heart of winter, that I was able to stop by 105 Depot Drive. Just to make sure I could try a wide variety of dishes, I convinced Sam to tag along. Since I had been a little disappointed in the craw puppies during my first time, I was curious to see if things had changed some six months later. 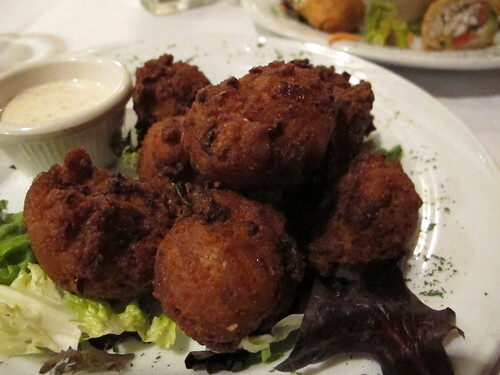 What was once an order of dense, over fried cornmeal nuggets had been reborn. With a salty, crunchy crust and tender, moist interior, the subtle taste of crawfish was present in every mouthful. 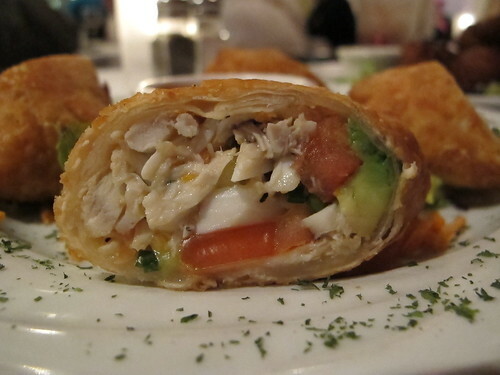 The crab and avocado spring rolls were a different story. Starting with a doughy, but crisp on the edges egg roll wrapper, there was a substantial amount of sweet crabmeat inside. Unfortunately the overabundance of avocado and out of season tomatoes ruined any chance that the crabmeat had to shine. More annoying than the blandness of the tomatoes was the one dimensional flavor of the dipping sauce. I may enjoy toasted sesame oil as much as any other Chinese ingredient, but the last thing I needed was a cup full of it. 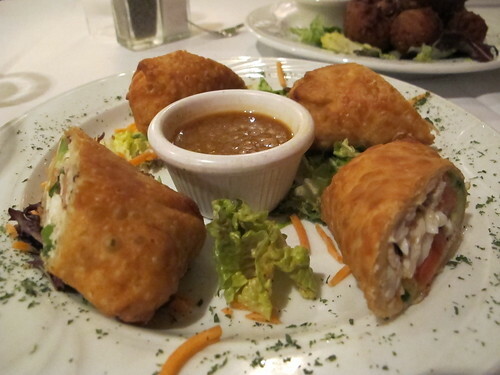 Even though the spring rolls may not have been the best use of picked crab meat, the crab cakes were an entirely different story. 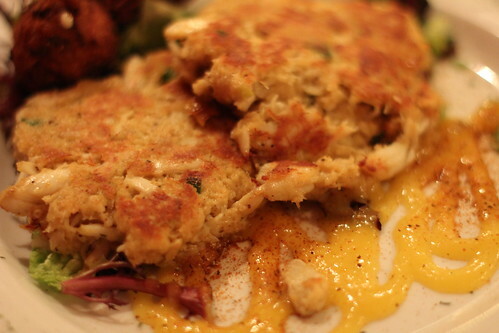 Shaped more like a crab pancake than a neatly packed puck, these crab cakes were very well seasoned and there was no doubt that the crab took center stage. 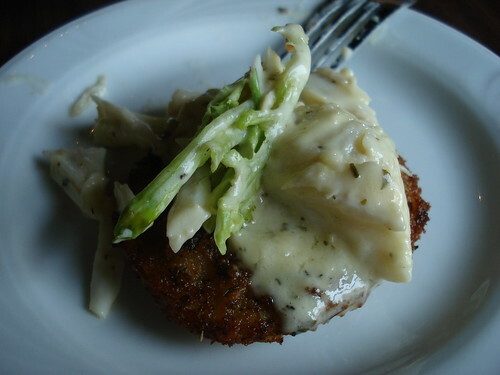 The mango coulis was an excellent addition to the plate and provided a nice dimension of fresh, fruity flavor to the already exceptional crab cakes. If there was one complaint, I wish the cakes would have had more of a crispy crust, but at this point that’s just nitpicking. 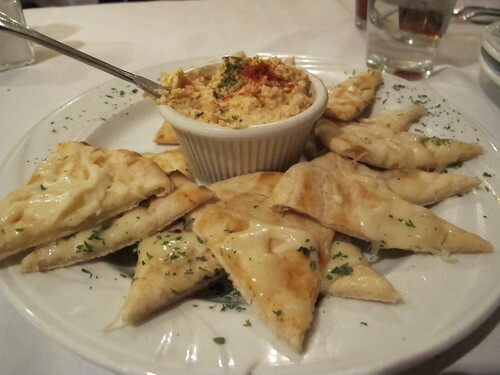 If there was one decidedly lackluster appetizer on the menu, it would have to be the pita melt. Described as pita bread with melted mozzarella and hummus, that’s all there is to this dish. It’s a decent hummus with a nice touch of garlic, but this dish is really just taking up space. 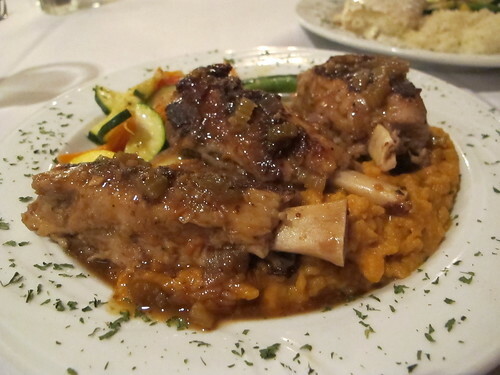 Although The Strawberry Café features a number of enticing entrees on their regular menu, that night’s special, the pork shins, was what really caught my attention. Don’t let the picture fool you, this plate of browns, beiges, and oranges may look less than appetizing but it was a complete homerun. 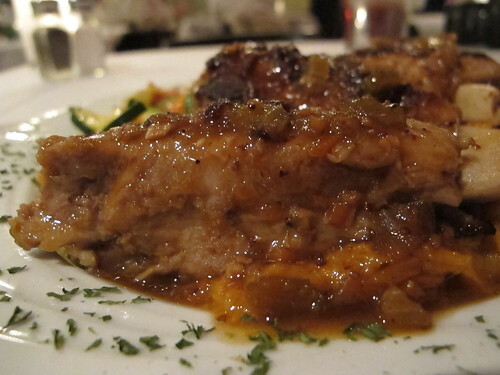 The pork shins were beautifully braised and fork tender. What was once a tough, sinewy piece of meat had been transformed into a piece of succulence that reminds you why pork is always a good choice. I may not be a dedicated fan of sweet potatoes, but this sweet potato mash makes a compelling argument for my conversion. The abundance of cinnamon, clove and other Christmas flavors may have been a few months late for the holiday, but with the right amount of sweetness, they played a marvelous foil to the pork shins. While I was reveling in the unctuous world of braised pork, Sam took the lighter road by choosing the second special, stuffed flounder. 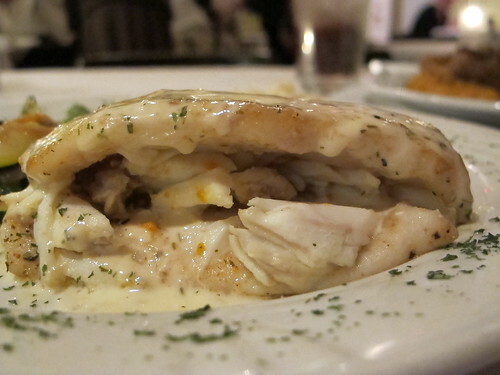 Stuffing flounder with crabmeat may be an old trick, but when it’s done well, it’s always a treat. 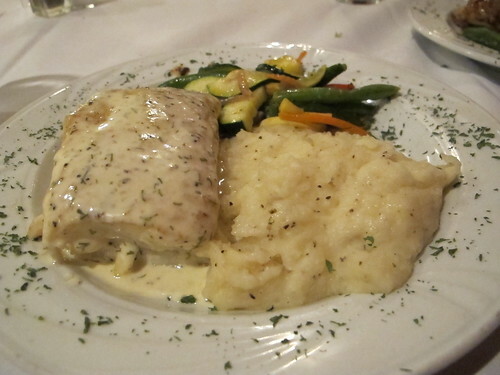 Having avoided the pitfalls of overcooked fish, this flounder was moist and very well complimented by the lemon butter sauce. The Strawberry Café may have a lot of crab on their menu, but when it’s cooked this well, I’m not complaining. Before I could close the books on The Strawberry Café, I felt the need to pay them one more visit. Thankfully, it took less than six months for the third opportunity. A few weeks ago, I had to make a quick run out to Madison. Since I never waste an opportunity for a good lunch, I left a little early and popped into The Strawberry Café. 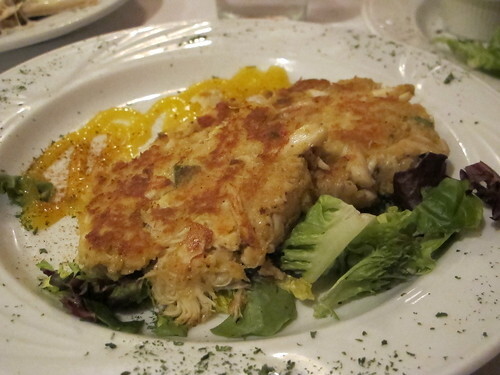 You may not have noticed but it seems like every dish I’ve tried at The Strawberry Café, in one way or another, features crab; well, this visit was no exception. 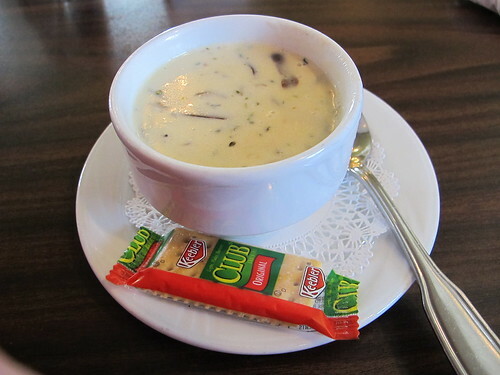 I had my mind on a nice bowl of soup and when the waitress told me the soup du jour was cream of crab soup, my mind was already made up. This was a delicate soup. The kitchen took extra care with the spices and it paid off as the sweetness of the crab meat dominated every spoonful. 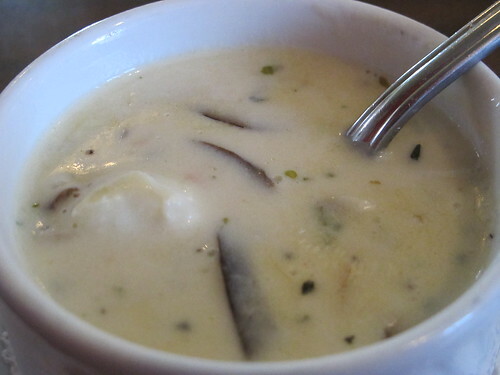 While I did enjoy the meatiness of the mushroom slices, this soup was a little watery and missing the creamy richness that I expect from a “cream of” soup. 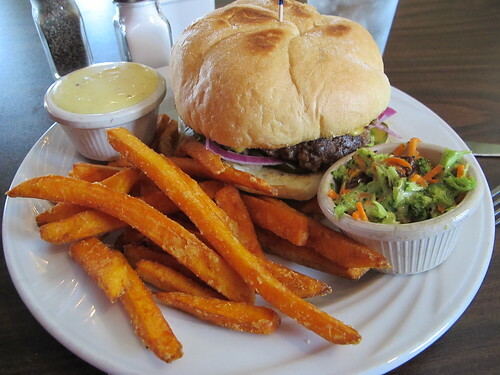 Choosing an entrée is never an easy task and while The Strawberry Café has all manner of seafood, pastas, and grilled items, I can never turn down the chance to try a new burger. 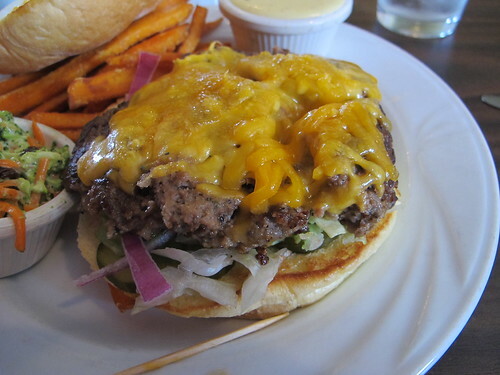 The Depot burger is six ounces of ground chuck that is “hand pattied” and served with cheddar cheese and all the fixings. 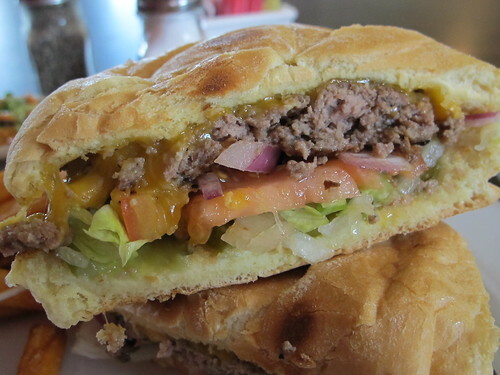 Sandwiched between the two halves of a Kaiser bun, this burger looks like it has potential. Using shredded cheddar cheese is an interesting choice. While I asked for medium rare, it’s hard to achieve that with a six ounce patty. Temperatures aside, what really struck me about this burger was the seasoning. Instead of the simplicity of salt and pepper, this burger tasted herby and peppery, almost like a meatball. 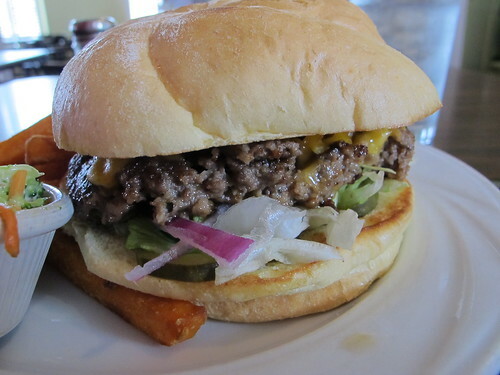 While I was missing the juiciness and beefiness of a homemade burger constructed from multiple cuts, the Depot burger is a fine burger, just a little on the plain side. 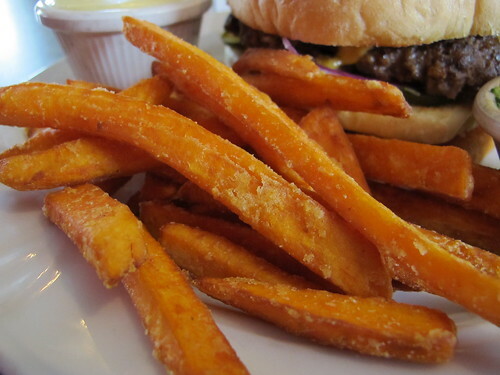 It’s hard to miss the neon orange glow of sweet potato fries especially when The Strawberry Café does a very nice job with them. The fries were some of the crispiest sweet potato fries I’ve ever had but I can’t figure out why they were served with honey mustard. Even though it took me the better part of seven months to pay The Strawberry Cafe enough visits, that is in no way an indication of the quality of their cuisine. In fact it’s quite the opposite. Sure, Chef Bach and his staff may have a few slipups on the menu, but overall, they present a quality product in a kitsch location. 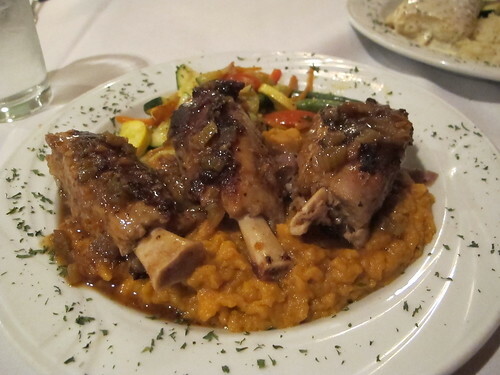 Madison, for what it’s worth, is lacking in worthwhile non-chain restaurants. There just isn’t very much worth trying out here. The Strawberry Café is an exception, it’s locally owned, locally operated, and in most cases quite satisfying. For those reasons alone, The Strawberry Café is a Madison standout and definitely worth trying. My visits to Stawberry Cafe are very similar to the cynical cook. I must say one occasion I ordered the special which was a fish dish that for extra money you could have it topped with"Jumbo shrimp" (which was 1.00 plus per shrimp), crab or crawfish. I received my order of fish with 2 "jumbo" shrimp on top and it was laughable. They were so small and would NEVER met the classification as jumbo. I said something to my waitress and she say"I'm sorry". Chief nor manager DIDNOT come to table as a matter of fact all that I got was the waitresss apology and it didn't come across as genuine . They don't know how to treat customers. It's sad.